Montclair Prep fans know Max Fried to be a two-sport baseball/basketball star, but his future will most assuredly be on the diamond. The highly touted pitcher has committed to play college ball at UCLA once he completes his upcoming senior year. 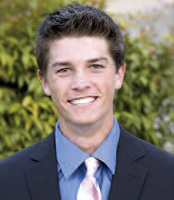 As a junior, Fried posted a 7-3 record to go with a 1.31 ERA in guiding the Mounties to the CIF Division V quarterfinals. He struck out an impressive 100 batters in just 69 2/3 innings. Fried was also prodigious at the plate, batting .360 with 30 RBIs. UCLA was quick to grab a commitment from Fried after the 6-foot-3 lefty completed a sophomore season with a 10-3 mark and a 1.81 ERA. He was named the Olympic League MVP and to the All-CIF Division V first team. On the hard court, Fried was part of a guard tandem that led the Montclair Mounties to the Southern Section 5A championship game this past season.